Svelto.ECS wasn’t born just from the needs of a large team, but also as result of years of reasoning behind software engineering applied to game development(*). Compared to Unity.ECS the main goals and reasons for Svelto.ECS to exist are different enough to justify its on going development (plus Svelto is platform agnostic so it has been written with portability in mind). Svelto.ECS hasn’t been built just to develop faster code, it has been built to help develop better code. Performance gain is one of the benefits in using Svelto.ECS, as ECS in general is a great way to write cache-friendly code, but the main reasons why Svelto.ECS has been written orbit around the shifting of paradigm from Object Oriented Programming, the consequent improvement of the code design and maintainability, the approachability by junior programmers that won’t need to worry too much about the architecture and can focus on the solution of the problems thanks to the rigid directions that the framework gives. I haven’t used Unity ECS so far, although I have seen some examples, so I can’t give much feedback about it at this moment, but what I have learned from Svelto.ECS is how important is to define entities at code level in order to keep coders from abusing the pattern and fall in the trap to write spaghetti code all over again. Let’s be clear, there is a very fine line between writing sensible ECS code and writing plain C code with global accessible data. The anchor that should help the coder to stay on track is to see Systems as a single-responsibility behaviour of a specific set of entities and not as a container of generic logic using global accessible data. All that said, let’s see what is new in Svelto.ECS 2.5. As you know, an Entity is built through an EntityDescriptor and an optional set of Implementors. An EntityDescriptor can generate the so called “EntityViews” and “EntityStructs“. In my examples I didn’t use many EntityStructs, but with the newest version of Svelto I started to rewrite and change a lot of EntityViews into EntityStructs as you can see in the new Survival Example Code. Implementor is a very interesting concept in Svelto.ECS. They are meant to act as a bridge between the underlying platform (like Unity) and the application engines. This is actually how testable engines, that don’t use any dependencies from the underlying platform, can be written with Svelto. However we used to use implementors to define Entity Components that were intrinsically independent by the platform too. With Svelto.ECS 2.5 Entity Components should preferably be defined as EntityStructs when they don’t need to act as a bridge with the underlying platform. EntityStructs are obviously mandatory to write cache-friendly code, but even when this kind of performance gain is not required, EntityStructs are still beneficial over EntityViews and Implementors because they allow to write allocation free code. A good implementation detail is that the relation between Entity Components and Implementors is not 1:1. One single implementor object can be used to implement many entity component interfaces. The interface is the abstraction of the underlying platform functionalities that are actually implemented by the implementor. However EntityViews are classes and every time an Entity is built, a set of objects are allocated on the heap. Therefore, why not declaring EntityViews as structs as well? Previously it wasn’t possible because EntityViews references were extensively used in Engines code, stored inside user data structures. With Svelto.ECS 2.5 the use of custom data structures that hold EntityViews references is instead highly discouraged. For this reason, Svelto.ECS 2.5 introduces the new concept of EntityViewStruct, which is a mix between the two worlds. When EntityViewStructs are used, only the implementors (in Unity mainly as Monobehaviours) are allocated on the heap. the use of EntityViews is still supported, but fundamentally obsolete. when Implementors are needed, EntityViewStructs should be used instead. EntitViewStructs should be used only when engines need to be abstracted from the underlying platform functionalities, although there are other exceptions. The Engines shouldn’t need know the implementation details behind the change of entity data (i.e. : the Survival demo code uses this design to wrap the Unity RigidBody functionalities, so that the Entity Components can return its parameters without exposing the RigidBody interface). EntityStructs should be used for all the other cases. When Monobehaviors don’t need to be used, entity components should always be seen as pure structs. EntityStructs come with the bonus to write way less boilerplate code (neither component interfaces nor implementors are needed). EntityViewStructs and EntityViews can hold only component interfaces. EntityStructs can hold only primitives and value types (no collections allowed either). Custom data structures defined in engines with the purpose to hold EntityView references should never be used unless strictly necessary. The main problem about using EntityStructs is that they don’t allow the same fine abstraction that EntityViewStructs do. 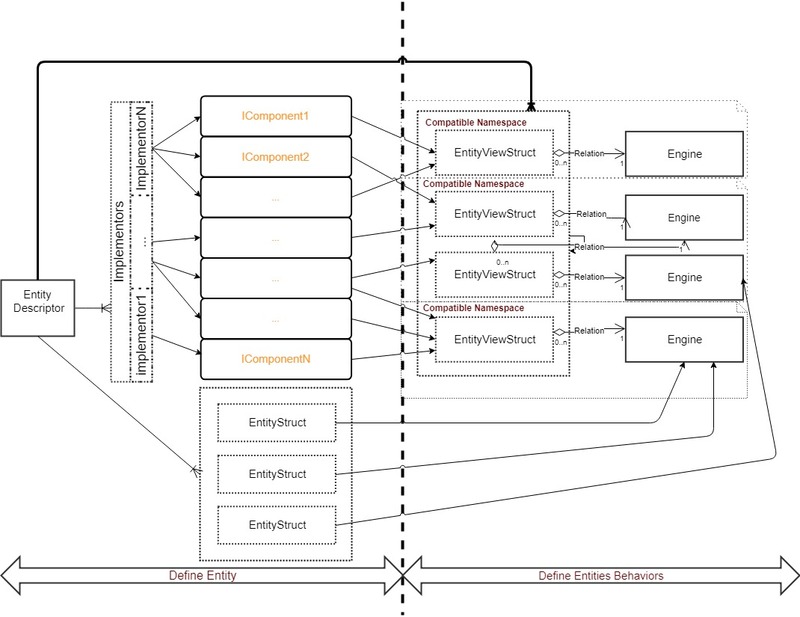 This is because EntityViewStructs, being defined by the Engines, allow to re-interpret the same component data under different engines point of view, promoting abstraction and encapsulation. EntityStructs instead are defined by the Entity and the Engine can only use them without semantic reinterpretation. That’s why EntityStructs should be as modular as possible, although the definition of an EntityStruct could have more practical repercussions depending if a SoA or AoS implementation is preferred. Being able to give to the same data different meaning is the only reason why EntityViewStructs could be still preferred to EntityStructs when implementors are not used to abstract the underling platform. For example, an engine can have a read-only access to the same data that another engine can write into. EntityStructs instead are always mutable as making them immutable would defeat the purpose of improving performance. If there wasn’t any dependency with the underlying platform, it would be possible to write a game with EntityStructs only, however I am still not sure how this would impact the overall design. Since entity views come with their relative Engines, an entity descriptor shows what behaviors (engines) will run on the entity (ie. :ZoomEntityView is used in the ZoomableEntitiesEngine). Using only EntityStructs I would loose this semantic, moving back to see Entities as a set of data only (without knowing where this data will be used). I understand this is a lot to take in. It shouldn’t be if you know how to use Svelto already, although you will need to change your current way to use it. If you are new to it, the best thing is to follow the survival example, as the code is simpler than the theory. Let’s start from our MainContext. Beside cleaning up some code, the most important difference is how I create the Player Entity. The Player Entity now has only EntityViewStructs defined with Implementors as Monobehaviors and EntityStructs for everything that don’t need to act as a bridge (precisely: HealthEntityStruct and PlayerInputDataStruct). you may notice how creating an Entity still looks quite readable! Especially if you don’t like the Svelto.ECS (minimal, I have to say), boilerplate, you are going to love the EntityStruct, as they are compact and they don’t need to define interfaces or implementors that must come with them. I put a lot of effort to make structs user friendly in Svelto.ECS 2.5. Unluckily I couldn’t achieve my final goals, as the interfaces I had in mind need the new c# 7.0 by ref features, so at the moment some functionalities around the EntityStructs are not final, but still OK (or at least the best the can be at the moment I guess). Let’s start from the initialization of the structs. This interface won’t actually change as I am actually happy with it. More often than not, you will want to initialize the value of your structs with initial values. This was quite badly managed by Svelto 2.0, as I want an allocation free and easy to understand solution. in this way the Player Entity will generate a HealthEntityStruct with the starting values you desire. Alternatively you may create an Engine that inherits from SingleEntityEngine<> or MultiEntitiesEngine<,>. They both implement the Add/Remove methods with a parameter passed by reference. It supports EntityStructs and the modifications made to it will be saved directly in the database. EntityStructs, which were already present in Svelto, must implement the IEntityStruct interface. They don’t allocate, they are cache friendly and they don’t use reflection. They are the top for performance. Thanks to the new Svelto ECS features, I would cautiously suggest to use them whenever you can. However keep in mind that they could make your code design worse and this is something I want to test in future on large projects. Now that you can use EntityStructs and EntityViewStructs, you are able to achieve zero allocation code while building entities. This would make Entity Pooling unnecessary. it’s much less nicer than using the byref return, but still reasonable. This is error prone for junior coders though, as by mistake the lambda could capture external variables, resulting in allocation. and let me using enemy directly not as a copy of the structure, but as a pointer to it. Svelto.ECS 2.5 boasts a new optimized centralized data structure to hold the data of all the entities. With one data structure only it’s able to hold EntityViews, EntityViewStructs and EntityStructs without causing any boxing allocation. The same data structure is able to query a set of entity data of a given type as an array or return a single one indexed by EGID. EGID stands for EntityGlobalID (or something like that, I don’t even remember how I came up with it) and it’s a combination of the EntityID and the GroupID where the entity is defined. EntityID must be unique inside a group. The same entity ID can be used across several groups. An entity can be present inside one group at time, HOWEVER nothing keeps you from creating two different entities, with the same ID, in two different groups to be shared separately. This is actually an example where the use of implementors “could” be smart. While I said that implementors should always be used as bridge between the platform and the engines, another possible use of implementors is to share the same data between different entities. In fact, several entities could be created using the same implementors. Without this trick, it would be hard to manage the same entity data in two different groups. It’s also possible to swap a specific entity between groups. At last, it’s important to remember that the EGID of an entity is not always the same over the time. Changing the group would in fact change the value of the EGID. I take the dead enemy ID and use the SwapEntityGroup to move it from the Standard Group to a special group ID I use to keep track of the disabled enemies per enemy type. Then when I have to reuse the Entity I will take its EntityViewStructs from the disabled pool. The EntityStructs must be reset as well and that’s what I do inside the ExecuteOnEntity methods. Note that all the implementors now are only Monobehaviours and they are not garbage collected, so that fetched EntityViewStructs will still point to the implementors of the GameObject linked to the Entity. Previously the RemoveEntity function didn’t need to specify the group where the Entity laid, it’s now needed. Svelto main communication forms are confirmed to be the Sequencer and the DispatchOnSet and DispatchOnChange methods. Currently DispatchOnSet and DispatchOnChange can only be used through component interfaces, but once c# 7 will be available in unity, maybe I will convert them in structs and let them be usable inside EntityStructs as well. DispatchOnSet and DispatchOnChange must be still seen as Data Binding systems and not as Events. I also improved a bit the Sequencer code, so that a declaration would be even more explanatory now. Remember that the main benefit of the Sequencer is to give to the user the possibility to understand the flow of communication from its declaration without being forced to check the code and reconstruct the communication flow from it. Note: Svelto.ECS (together with the companion Svelto.Tasks) is currently compatible with .NetStandard 2.0, Net 3.5, Net 4.5, unity IL2CPP/UWP. I was wondering what plugin you use for the beautiful vertical alignment. Thank you for this great project! Thank you a lot ! It seems to be a great way to make cleaner code ! Nice piece of work !